In both the profit and the non-profit world I enjoy working with people to help them find changes for their own and their organization’s benefit. I have over 20 years of international work experience, initially doing academic research and training in natural sciences, then broadening my range of interests and skills to include organisational development, participatory planning, monitoring & evaluation, knowledge management, and marketing & communication work for life sciences and other industries as well as international NGOs, networks and funders. Please find more on me on https://www.linkedin.com/in/kornelia-rassmann-58734631. 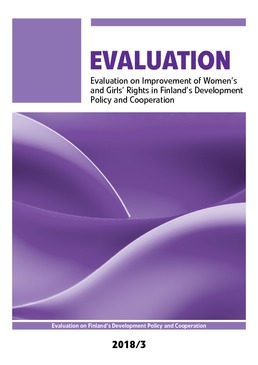 • Team lead of the evaluation on \'Improvement of Women’s and Girls\' Rights in Finland’s Development Policy and Cooperation\' (2012-2017) including an adapted Outcome Harvesting approach with case studies from three countries (Nepal, Kenya, Somalia) and the UN. 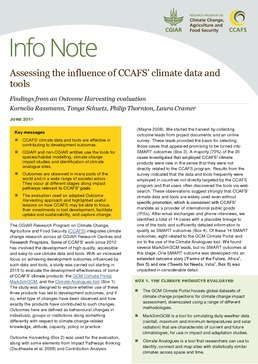 • Leading a study for the CGIAR Research Program on Climate Change, Agriculture and Food Security (CCAFS), developing effective evaluative approaches for evidencing the contribution of CCAFS climate data and tools towards development outcomes. • Evaluation and learning review 2012-15 of the ‘Global Network of Civil Society Organisations for Disaster Reduction’ (GNDR), a world-wide network of over 800 organisations, using a combination of ‘basic perceived outcomes, SMART outcomes and outcome stories. • Advising a consultancy team to employ an OM inspired approach to the summative evaluation 2009-14 of Twaweza, a citizen-centered initiative aiming for large scale change in East Africa. 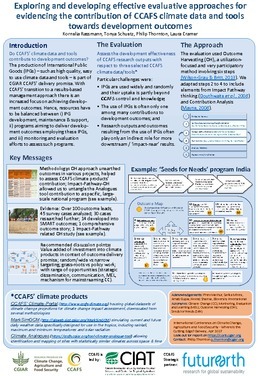 • Summative evaluation 2008-11 of CPC, an international learning network of c. 250 child protection agencies combining Outcome Harvesting with a Network Functions Approach. • Supporting the ‘Collaborative African Budget Reform Initiative’ (CABRI) in designing a communication strategy in the context of the development of their Strategic Plan 2015-18. • Scoping study for the ‘Accountability in Tanzania’ (AcT) programme aiming to enhance learning through the improved management and greater use of qualitative monitoring data. • Review of the first ten years of use of OM for the Overseas Development Institute / Outcome Mapping Learning Community. I feel privileged having participated in an OM training led by Terry Smutylo and Simon Hearn during my time as ‘Global Programme Officer’ at BioNET-International, aiming to develop an improved M&E system for this international capacity building environmental network together with my colleagues Richard Smith and John Mauremootoo. Further, we appreciated engaging with Ricardo Wilson-Grau who was commissioned as external consultant for the Outcome Harvesting (OH) based evaluation of BioNET in 2010. Our learnings from this evaluation are summarized in a peer-reviewed paper for http://betterevaluation.org authored by Richard, John, Ricardo and myself (summary and youtube introduction see here: http://betterevaluation.org/blog/outcome_harvesting_bionet ;). With my academic background, I like working in a structured, efficient and effective way and have strong skills in analyzing qualitative and quantitative data sets, as well as in presenting and writing up results (in English and German). My multi-disciplinary experience is a valuable asset for the kind of projects I am engaged in, ranging from project/programme planning and management, strategy development, and monitoring & evaluation (e.g. Logical Framework, OM/OH, Theory of Change approaches), to capacity building (biodiversity), communication, advocacy, fundraising, facilitation, and research. Finally, I enjoy networking and working in a people-centered, respectful and participatory way and am excited, when joint efforts make it possible to better reach shared goals and visions.